I had gotten my hands on another 12v battery when my car needed a new one and got some of my UPS batteries together too. So I have run some more tests on my Baldor up to 48v. I thought I would post the data. I am getting almost triple the performance from the OE motor!! Built around a 1.1ohm winding, I am sure the amperage consumption is better the the normal asym motor here, as for instance, Ufo's Imperial. there is a Baldor office in the Philadelphia area near me. I would love to show this to someone there! I remember how Ufo's Imperial motor did around 3400 rpm on 48v, but mine is only a dual brushset, while his is a quad. I've been watching for a long time your Assymmetric Machines. I want to build an generator to add more power in my PV off-grid system , especially in winter time and cloudy days. Can you help me with some ideas? P.S. What happened with your website? From Romania it appear to be expired. Thanks for following my Asymmetric Machines. My server at home plus my remote server where I got the site, have been attacked...and will take me a while to restore. If you want a RELIABLE SYSTEM to self-sustain in winter time, please check the 3 Battery Energetic System...they are good and easy to build-install and run. Where I can find more info about "3 Battery Energetic System". I try on google, but no results. My off-grid system is composed by: 3700Wp PV panels, 5kVA inverter and 24kWh lithium battery from a salvage Nissan Leaf. Also, I find a picture on internet which I suppose is made by you. I can made this on radial flux or axial flux to use with a wind turbine. What do you think about this? And yes, that's my drawing, it is an outrunner bldc that I built from scratch...works beautiful. On the 3BGS THREAD, You will have to go over the whole thread FIRST!...Please DO NOT start asking questions before getting the MAIN WHOLE IDEA on its SPECIFICS. My basic rule when I find a new thread is to read first the whole thread before to ask. I don't like people who ask first before reading. What is your opinion about building a generator base on that drawing? Also, I want to wound coils in bifilar Tesla style. Be careful with 3BGS and Lithium batteries. Lithium batteries require sophisticated cell management (BMS). If run without BMS and on a system where overcharge is possible (maybe unavoidable), disaster is likely. All the 3BGS use lead-acid of which I am aware. Lead-acid is pretty forgiving about charge. You have right with over charge lithium chemistry. After I started to read that thread, I think it's not for me. This is why I insist to build a generator based on Ufopolitics asymmetric style. And yes, that's very true! Vastdragan has the batteries from a Leaf...it should have the BMS in the package. The Nissan Leaf is the "Old School" Electric Vehicles...meaning their motor controlers run SO HOT, that it needs a whole cooling system just like the Farting Machine needs...radiator plus electric fans....what I want to say...is that it is designed to stand heavy loads. The Teslas Vehicles runs very cool (do not need a radiator w/ big fans), even though the battery bank has a small liquid cooling system...just like some PC Motherboards uses. I am announcing my return to this forum after some years. I hope you in good health and doing well. Last edited by Lightworker1; 02-07-2019 at 06:46 PM. Returning to the forum after some years. Blast from the past post here... I've often thought over the years that we really didn't get everything we could out of this new design you developed for this simple 5 pole motor. You termed these rewound motors "assymetric machines", and rightly so. They are not a completely closed system, and I believe that was your original intent - keeping the dipole open, in order to allow the aether to interact with the apparatus with each pulse it produces. 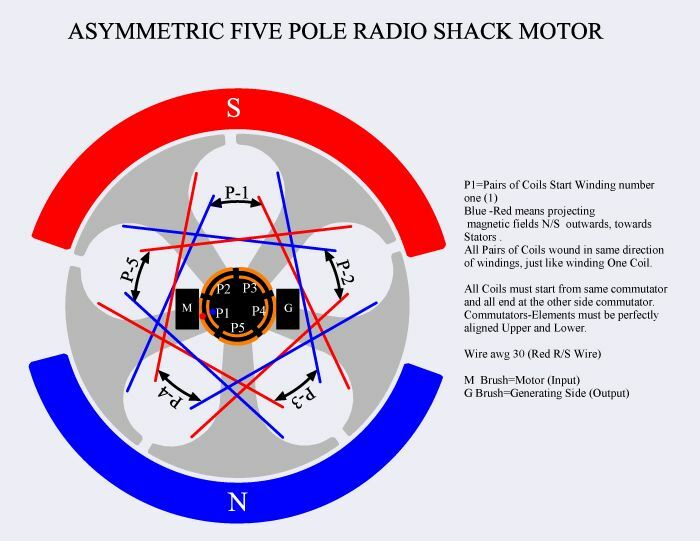 I can't help but wonder what it would take to get your 5 pole motors to function in a way similar to the way EV Gray's motors did. While there were design differences (e.g., the Gray motor used stator coils, rather than magnets, I believe), perhaps some of the principles from Gray's work could be applied. I believe Gray's motor design used pulsed charge to stress the dielectric in an exaggerated way, forcing it to essentially "push back" charge into the motor. Consider (and I'm sure you have) Don Smith's understanding of how capacitors work - that a charge supplied to one plate draws a charge from the aether to its opposite plate. Seen this way, the capacitor essentially stresses the dielectric, and the dielectric/aether responds with a charge to the opposite plate. How can we take your rewound 5 pole 2 commutator motor and integrate this concept of increased dielectric stress into it, to increase its interaction with the aether through greater capacitive dielectric stress? FYI this 5 pole design with a N and S wound component to each sub coil general design feature was found not to perform as well by Ufopolitics and he presented the "homopolar" design around page 220. It really boosted power probably another 10-20%.